Another hot day, 31C inside (cooler than outside) and I am drinking iced tea and recovering after a sweaty walk to getting groceries. Even the locals were complaining today: “Madonna! Che caldo! E insupportabile!”. Now after lunch, those who are not at the beach are secluded indoors, blinds are dropped and fans are on, it’s OK if you do not do much. On the way, dragging my carrello (personal shopping trolley) along the bumpy sidewalk, I met a neighbour, loading her car on the street, with bags and dog, who explained that they were departing. “Buona vacanza! Mare o monti?“, I asked: sea or mountains? Those are the options from Rome. Oh, the mountains, she said, but actually it was only her dog who was going on holidays. He was going to her sister in the mountains, to cool off for a couple weeks. When the dogs get moved, it is definitely warmer then normal. We even had mystery packet ramen noodles for dinner the other night. Cook three minutes? Perfect! 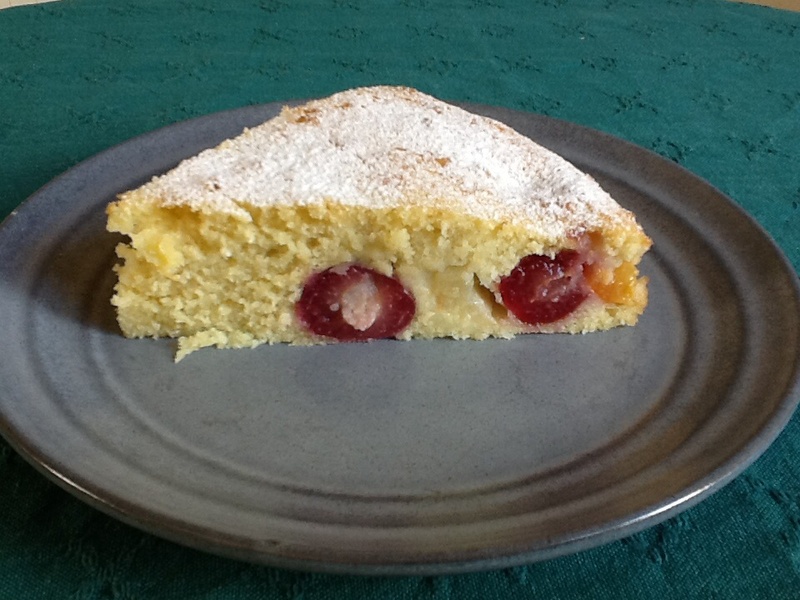 Still, we had watermelon and peaches and cherries, and a friend arriving, so this impromptu cake was made – then the kitchen was barricaded off to block the heat. Whisk eggs and sugar, add the rest and whisk (not too much after flour is added). Layer baking parchment on base of 24 cm springform tin. Add half the batter, then fruit dropped over, then spoon on rest of batter. Bake in middle of the oven at 200C for 40 min or so. 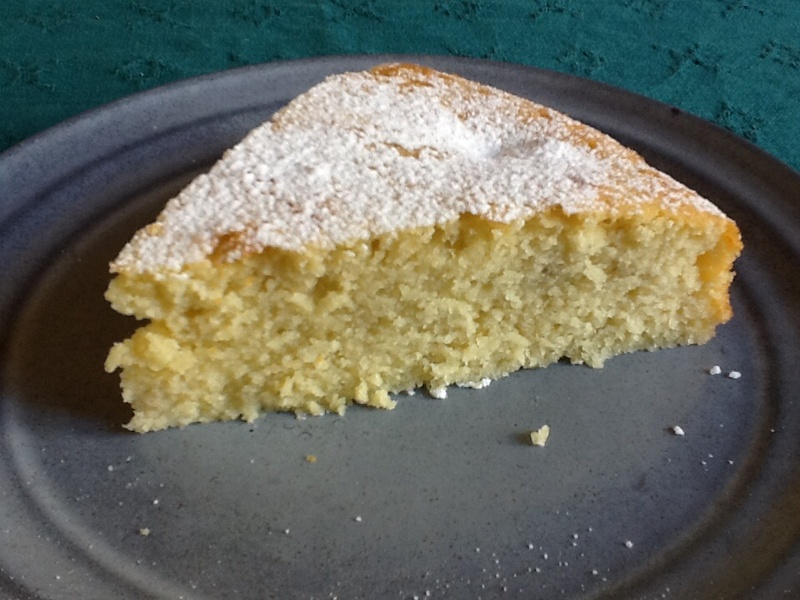 Cool and serve; sprinkle over a little icing sugar if you wish. 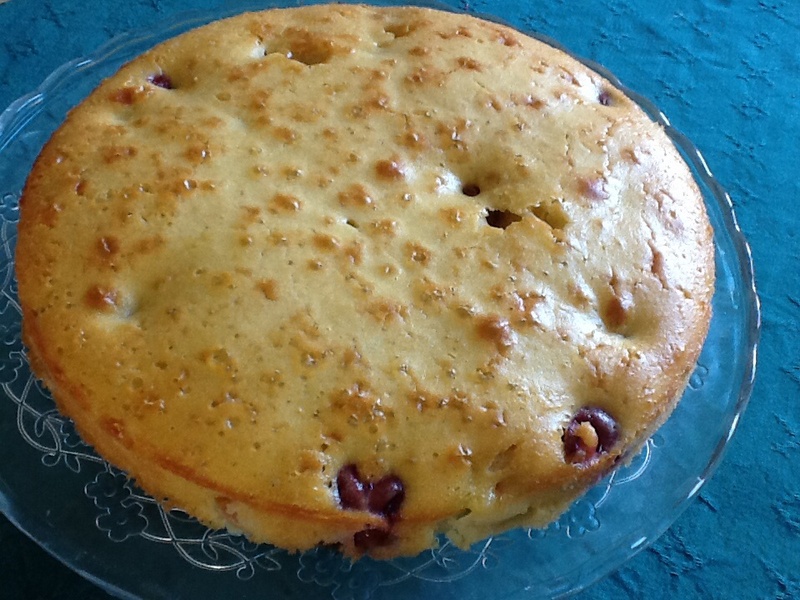 I did not use much butter, which means the cake might be bit pale, but the structure was fine and the fruit comes through well (depending where you slice the cake…..). Wishing you all cooler days soon! 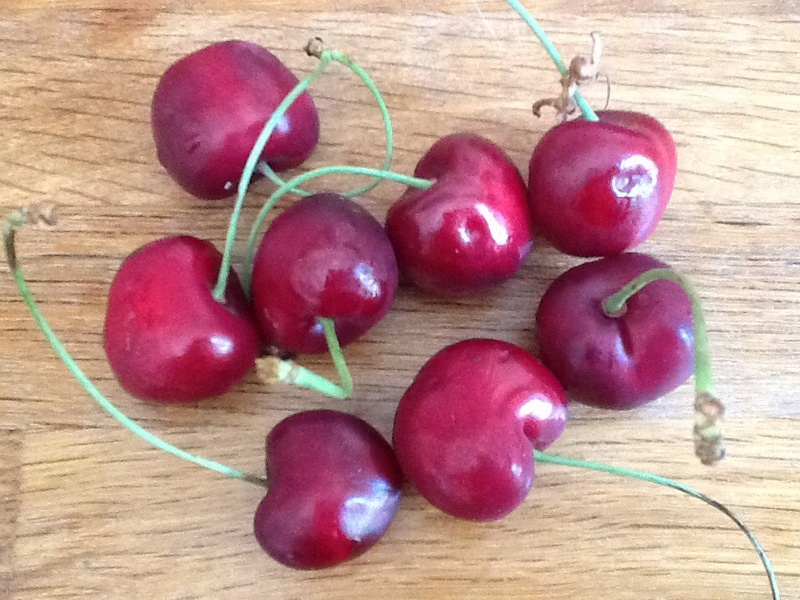 This entry was posted in food, fruit, Rome and tagged cake, cherries, summer on July 11, 2015 by krumkaker. 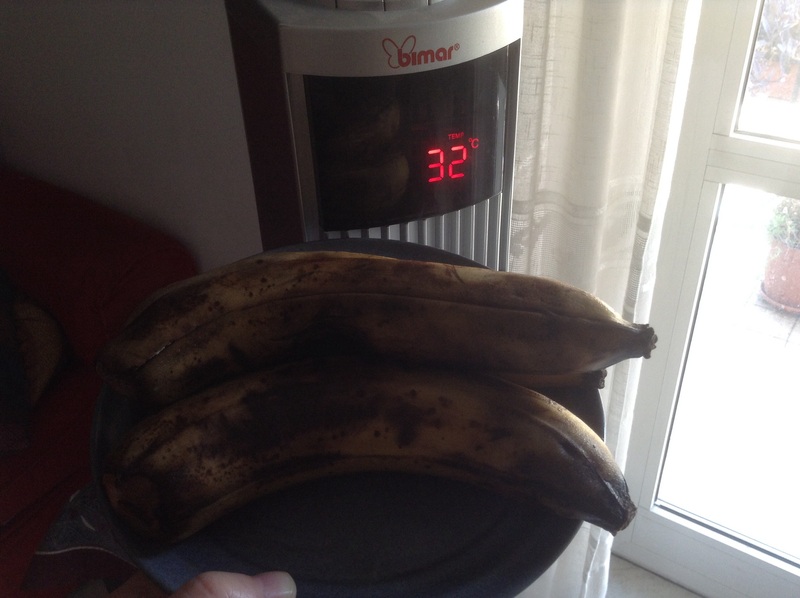 Rome is in the midst of a heatwave, and our cooking is diminishing, as the temperature rises. 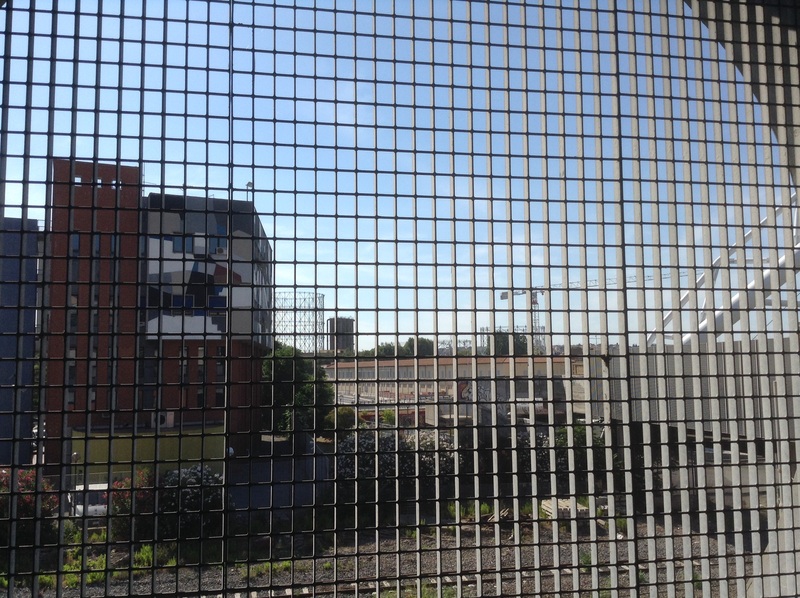 This is the view from Garbatella metro, with the new bridge and in the distance, the old Mercati Generali under renovation. On the way home in the afternoon, I stock up: watermelon, figs, mozzarella, striped melons: what to eat? Anything requiring minimal time in the kitchen. Still, these collapsingly ripe bananas obviously meant it was time to make banana bread! Cold showers before and after entirely optional. 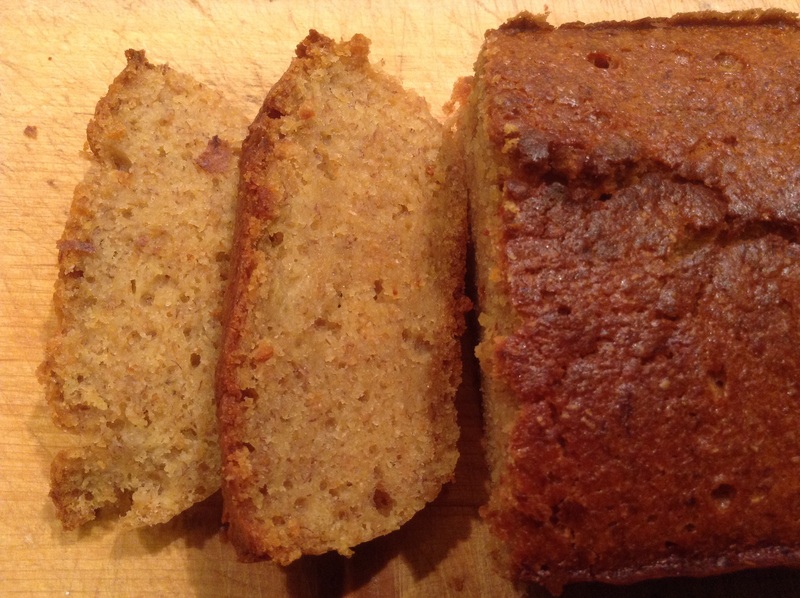 I’d bookmarked this recipe a while ago: Grov honning banana kake (in Norwegian), which is a banana cake with honey and wholewheat. It looks amazing. I tweaked it slightly, since I had three bananas, and it is actually rather nice. Whisk eggs and sugar. Add honey, butter and mashed bananas. Add flour, salt and baking powder. Add milk and vanilla extract. Divide between two loaf tins, bake 55 min at 180C. If still pale, add 10 minutes at 210C to crisp it up a bit. This has a lovely honey-banana flavour. It was a little moist in the middle, so maybe bake at 200C next time? Or reduce milk to 180ml. I will see what it is like when cake has cooled down properly. Still, very tasty, and well worth turning the oven on for! 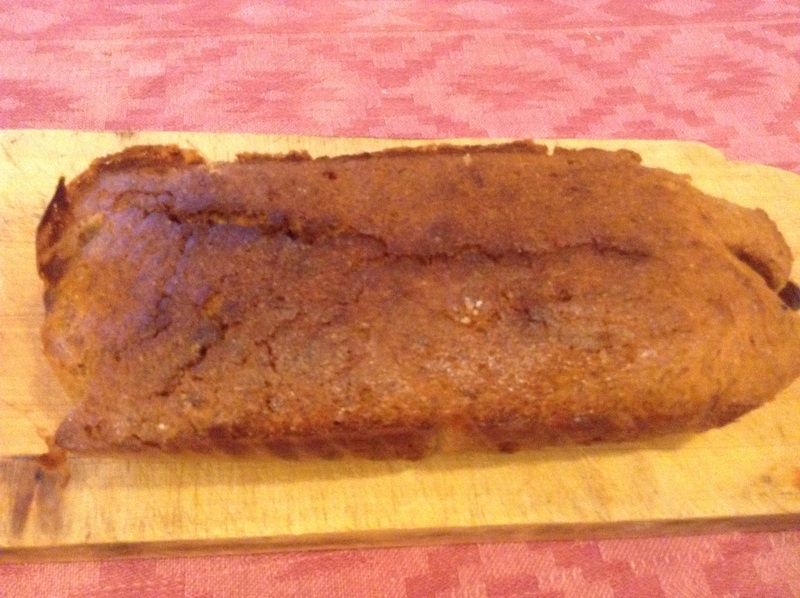 This entry was posted in food and tagged banana bread, cake on July 5, 2015 by krumkaker.